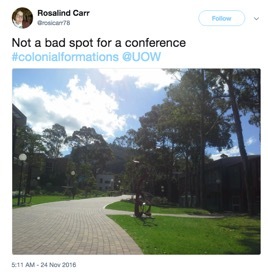 Adam J. Barker shares his thoughts on the first Colonial and Settler Studies Network conference, Colonial Formations: Connections and Collisions, held at the University of Wollongong in November 2016. You can follow Adam on Twitter: @adamoutside. What is a ‘colonial formation’ and why should such a thing matter? The answers, it turns out, are ‘many different things’ and ‘because without understanding colonial formations, we cannot understand the shape of contemporary life’. That lesson was brought home to me during the conference titled ‘Colonial Formations: Connections and Collisions’, hosted by the University of Wollongong in Australia, in November 2016. This conference was a intended as an opportunity to explore the intersections and divergences between a variety of state polices, individual actions, and community developments that can be described as ‘colonial’. More than that, the conference cast a wide net, crossing all continents and encompassing several centuries, and considering concepts such as slavery and indentured labour, carcerality and prison colonies, identity and place-relationships, the role of landscape in either inscribing or resisting colonial power, and – of course – the internecine conflicts between scholars over the meanings of any and all of these terms. While that may sound like an unlikely mix of interests, approaches, and personal entanglements, what emerged was an exceptionally rich intellectual discourse that also made us laugh and cry, and intense interpersonal interactions that were as enlightening as any course of study could be. I participated in the conference along with several scholars close to my personal and professional hearts. My partner and frequent collaborator, historian Emma Battell Lowman (University of Hertfordshire), was chief among them, although for a change we did not present the same research paper – it was great to hear her present from the audience for once! (More on that later.) We were also joined by a third member of the Settler Colonial Studies journal editorial collective, the eminent historiographer and political theorist Lorenzo Veracini (Swinburne University of Technology), and by Emma’s former doctoral supervisor and my then-boss, the renowned historian of empire Clare Anderson (University of Leicester). To be honest, we would have travelled the 23 hours to Australia from Leicester, UK, just to sit at a table with those two brilliant experts, but unbelievably, the conference had many more superb scholars – and amazing people – that we had yet to meet. Like so many conferences, sessions were scheduled in parallel. This meant, on one hand, that it was impossible to hear all the papers delivered and inevitably I missed very important work that I had hoped to hear about. On the other hand, presentations were given in relatively small rooms to energetic groups, and there was a feeling of intimacy and active listening throughout. It was entirely possible to have a flowing, creative exchange of ideas between presenters, and between panels and the audience, which was a wonderful deviation from rigid protocols and huge auditoriums at major international conferences. So, with that caveat in place, the following are some of my personal highlights. The first timeslot on the first day featured a roundtable, where a variety of scholars weighed in on the controversies and potentialities of the ‘field’ of settler colonial studies (if such a thing exists). The panel included (among others) the aforementioned Lorenzo Veracini, the well-known historian, brilliantly passionate speaker, and conference organizer Jane Carey (University of Wollongong), and Nadia Rhook (La Trobe University), a scholar who I did not know before the conference but whose work on colonial mobilities across the Pacific and Indian Oceans was very impressive and inspiring. This roundtable ranged across a variety of topics, including some with which I was completely unfamiliar – such as critiques going back to the 1990s that helped to change and shape the trajectory of settler colonial studies – and some that were more familiar but no less important, like the utility of settler colonial analyses for building antiracist solidarities. Settler colonial studies was presented neither as flawed or flawless, but rather a perspective that has been shaped by the tensions generated by both the successes and critical shortcomings of scholars engaging settler colonial theories. As a field of study, settler colonial studies was recognised as important in foregrounding considerations of mobility, temporality, and desire in research on colonisation, even as scholars using the tools of settler colonial studies were cautioned against overly ‘locating’ Indigenous agency in colonial spaces. This conversation was ultimately productive even though it ended in no final consensus on the state of the field – all the same, it beautifully foreshadowed the rest of the diverse conference. That evening’s keynote ran the opposite direction: Clare Anderson gave an in-depth look into the historical connections running through studies of penal colonisation. Beginning with accounts of an 1817 tribunal that stood in judgement of a number of convicts in Mauritius, charged with attempting to escape their sentences and armed resistance to arrest, Anderson took us on a tour of the ways that class, caste, justice, and state violence were differently transited through the bodies and workplaces of penal labourers. Anderson noted that the convict labour in Mauritius was both responsible for generating huge wealth and for constructing a large amount of public infrastructure, essentially setting the base for the entire system of property and class in that region that continues to this day. Convicts in many locations filled labour gaps, and so occupied ambiguous positions as both colonized (dominated) and colonizing (displacing). Given the entangled and ambiguous positioning of penal convicts in larger colonial systems, Anderson argued for a need to focus on ‘connections’ – between people, across space, and over time – to help understand the contingency of unfree labour, transportation of convicts, and colonial projects. It was a fitting end to this first day that, following the keynote, Professor Anderson was lauded at the launch of her new book (co-authored with Madhumita Mazumdar and Vishvajit Pandya), New Histories of the Andaman Islands: Landscape, Place and Identity in the Bay of Bengal, 1790–2012 (Cambridge University Press, 2016). The next day saw my own contribution to the conference as part of a panel on memorialisation and shared history. I was exceptionally lucky to present alongside both scholars and practitioners, working in different ways to either interrogate and deconstruct colonial memories, or to read against the grain of history to recover and re-inscribe Indigenous memory on place. Jodie Stewart (University of Wollongong) and Jessica Neath (Monash University) both presented different perspectives on the way Indigenous memory is inscribed on (or erased from) place. Stewart discussed the (re-)construction of the Bundian Way, a pathway between Targangal (Kosciuszko) and Bilgalera (Fisheries Beach) that connects the highest part of the Australian continent and the coast. This pathway is more than just a transportation route: walking it retraces hundreds of years of history, myriad relationships between the human and non-human (or more-than-human) world, and asserts the dependence of people on place for survival. The Bundian Way’s recovery and development has provided enormous opportunities for Indigenous ways of knowing to be shared and made vital in the present. By contrast, Neath presented on research about conspicuous absences. By contrasting the undeniable presence of certain kinds of memorials – including to valourized war dead – with the absence of memorials to Indigenous loss, Neath raised serious questions about the role of public space in generating critical counter-memories. Comparing the public, permanent recognition of the costs of colonisation in Australia to other settler states, Neath both troubled the idea of memorials to the dead as they are commonly conceived (think of large, marble statues with glorious figures attached), and the landscape of public memory in colonial contexts. Skye Krischoff (University of Adelade), an ethno-historian, turned the idea of historical narrative towards the individual and personal level, investigating historical narratives and cultural memories around settler people who had, at some time, lived among and were dependent upon Aboriginal communities in Australia. These stories, fitting so poorly with master narratives of disappearance, non-encounter, and the dominance of both lands and Indigenous lives by invading societies, reminded us that history is not always what it appears. Sometimes, as Krischoff pointed out, the only way to counter broad cultural ‘misremembering’ is to delve deeply into the fantastical, partial, and somehow still true stories of people and times that follow a different path than what we would expect. Finally, my own contribution to this panel consisted of a consideration of the role of ‘deathscapes’ – landscapes specifically made up of cemeteries, memorials, and other spatial organization around the dead – in creating settler colonial space. I looked at the memorials to the war dead of the American-British War of 1812 scattered around my hometown of Stoney Creek, Ontario, and how these – alongside more ‘banal’ cemeteries – rewrote historical memory. The dead British soldiers buried in mass graves were recast as ‘the first Canadians’ in a time before Canada, setting a mythical origin point that still obscures the longer history of Haudenosaunee and Anishinaabe occupations of and claims to those same places. This panel was tied together not just by a historical focus, but a deep and profound investigation of how we – as people and communities, rather than historians – remember ourselves, our pasts, and the places we belong. The experience was, in many ways, unsettling: I began to question why there is no equivalent to the Bundian Way in my hometown, why the stories of individual settlers from times past never include extended relationships with Indigenous peoples, and ways that Indigenous presence not only can but in fact must be read into history and written on the land. My two favourite paper presentations of the conference actually happened back to back during the final panel of the final day. I had been anxious to hear my colleagues from the Settler Colonial Studies journal, Emma and Lorenzo, talk about their current research for some time, and their consecutive presentations were unintentionally perfect complements. Emma presented on the idea of ‘becoming settler’: as settler colonial studies have argued that settler societies tend to divide people into three subjective positions (settler, indigenous, exogenous), Emma asked how people move between these positions. Specifically, through an examination of the life of Rev. Stanley Higgs, an Anglican missionary who travelled from Birmingham, UK, to the Cariboo region (the interior of British Columbia) in the early 20th century, Emma traced the life course of a man who very clearly came as an imperial agent and interloper, but who transformed in identity and practice into a settler over time. Looking at evidence of his animus – either the animus manendi, intent to stay, or animus revertendi, intent to return – as well as Higgs’ construction of ‘family’ such as his ‘Indian mother’ on whose grave his ashes were eventually scattered after his death, Battell Lowman constructed a complex and challenging but fruitful pathway for considering how people are recruited into settler colonial systems and societies. Veracini, then, took us on a journey in the opposite direction. He dared to articulate, if partially, a ‘decolonizing passage’ through which we could move from the current settler colonial world to that which will (not might!) come after. 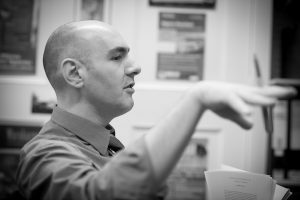 Beginning by dismissing right wing solutions to the problems of settler colonisation as ‘deficient’, pointing out that they essentially seek to solve problems with more of the same processes that created the problems in the first place, Lorenzo argued for the need to look through the lens of settler colonialism while also studying the lens itself, and trying to interpolate from these two foci what a world without settler colonialism would look like. In his presentation, Lorenzo gave what was, for me, the quote of the conference. Drawing from Franz Fanon and arguing that settler colonisation relies on dehumanising both the coloniser and the colonised, Lorenzo asserted ‘my humanity is to come – it will follow decolonization. Fanon got it right.’ I cannot imagine a better rallying cry to the cause of settler decolonisation. Andrew Shaler (University of California, Riverside) examined the role of Indigenous people in the California Gold Rush, both those displaced by the incoming miners, and those from other places – already displaced by other colonial formations – who sought their own fortune in the California gold fields. Sadiah Quereshi (University of Birmingham) interrogated the intellectual traditions of the West, including the academic systems in which all of us operate, to find the historical roots of contemporary genocidal systems. Niccolò Pianciola (Lingnan University) provided a fascinating glimpse into ‘waves’ of colonisation that swept over eastern Europe and central Asia, and the historical patterns that saw Russian Cossacks colonize and displace Kazakh and Kyrgyz nomads and peasants, only to be in turn colonised and displaced by Soviet forces following the Russian Revolution. Michael Griffiths (University of Wollongong) interrogated the ways that Indigenous presence is ‘obscured’ or made invisible in literature, through the lens of critiques of the politics of recognition as mobilised by Indigenous scholars such as Glen Coulthard and Audra Simpson. Sera Waters (University of South Australia) literally picked through the rubbish – the discarded material of several settler-colonial families – to both interrogate wider systems of production and consumption, and the personal implications when settler families and communities turn place into waste. Jennifer Newman (Australian Catholic University), who identified as descended from long lines of Wiradjuri and Australian yarn spinners, told the tale of the countering and ultimate undoing of former Australian Prime Minister John Howard’s attempt to create a ‘reconciled’ postcolonial nation – and lived up to her story-teller billing, having the whole room hooting and clapping along with her cutting insights and jests. I could go on… and on…. 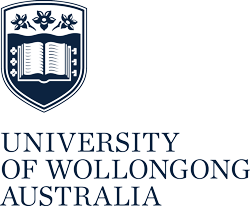 Hosted on the beautiful grounds of the University of Wollongong, the conference was exceptionally welcoming, well-run, and open. When the families of some attendees arrived towards the end of the day, several including young children, it was a breath of fresh air and at least one historian could be spotted dashing through the large gardens and greenspaces at the University, playing hide and seek with the children. I would argue the conference would have been improved by the presence of more of these young folks – after all, it is their future world which we were discussing, and their future memories and histories that we will one day become. Further, many of those we met at the conference were students, both undergraduate and postgraduate, and it was especially energizing to speak with them about how our work could be made more useful to their communities and struggles. The participation of Indigenous people was also impossible to miss, beginning with the opening ‘Welcome to Country,’ delivered by Aunty Barbara Nicholson. Her welcome included reminders that the land we sat on was contested, stolen land, and a demand that we keep that in our thoughts and not allow our academic work to simply become the stuff of dusty books and obscure conversations. When her welcome ran long – although not a person in the audience was grumbling – she unapologetically and hilariously dismissed the time distraction, saying ‘That’s what happens when you give a Koori woman a microphone’. 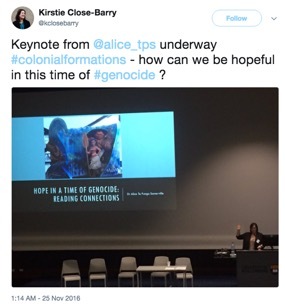 The conference closed on a similar note, with the keynote on the last day delivered by Māori scholar Alice Te Punga Somerville (Macquarie University) who delivered a tear-jerking, heart-thumping interrogation of ‘Hope in a Time of Genocide’. Reflecting on the portrayals of Indigenous Pacific Islanders in movies like Moana (released that same month), alongside the scarcity of places where one might go to be immersed in Māori language use, Te Punga Somerville dared us all to dream of a place and time where Indigenous presence was not the add-on, the exterior, or the extra, but the core of relationships to the land and between diverse peoples. Hopefully, the work of the groups that came together at Colonial Formations conference last year will continue. I know of at least one special issue for a journal that is underway, and that is very encouraging – maintaining lines of communication, even productive ones, can be difficult in the current academic environment where administrative responsibilities and applications for funding seem to dominate everyone’s worksheets. But more than this, I hope that the critical historical knowledge and decolonial visioning and inspiration on display at this conference continues to flow beyond the boundaries of the academy. Scholars are unlikely to be the key to decolonisation of any colonial formation, but perhaps if we maintain collective efforts such as this, we can contribute more than we have previously. That sense of the possible and also of the responsibility to make the possible into reality are what I take away from this experience. This entry was posted in Blog, Event reviews and tagged Adam J. Barker, Colonial Formations, conference by kbagnall. Bookmark the permalink.